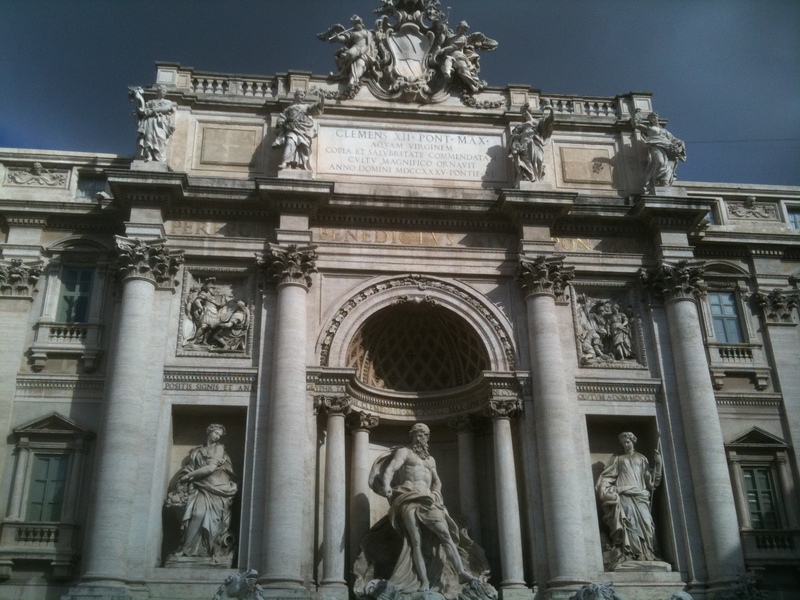 Our tour today was Monument Rome which started at 8:30 AM at the Vastours office. We got up early to have some breakfast at the hotel and waited at the lobby for the tour company to pick us up. Just about when we were ready to leave our room to wait for the bus, Bao told me that our Canon Sureshot was gone. We looked but couldn’t find it in the room. She then said that it was most likely lost at the souvenir shop at Basilica St. Paul. She probably placed the camera on the counter as she paid for the chocolate we bought. Well, we’d have to make another trip to Basilica St. Paul after our tour early afternoon. Around 8 AM, a guy showed up at hotel lobby and took us to a van parked nearby. After a couple more stops at other hotels, we arrived at the tour company at 8:20 or so. Tour bus started at 8:50 because some people had problems with their remote controls and earphones. Today we had about 40 tourists and our tour guide divided us into a Spanish speaking group and an English speaking group of about 20 people each. The three-hour Monument Rome tour included visits of Trevi Fountain, Pantheon, Piazza Navona and finally St. Peter’s Basilica. The bus took us through Via Veneto which was made famous by movie “La Dolce Vita.” Since there wasn’t much to see from the bus, I had to come back later to check it out. After driving by Piazza della Repubblica and Najadi’s Fountain, our bus dropped us off at an underpass and our tour finally started on foot. 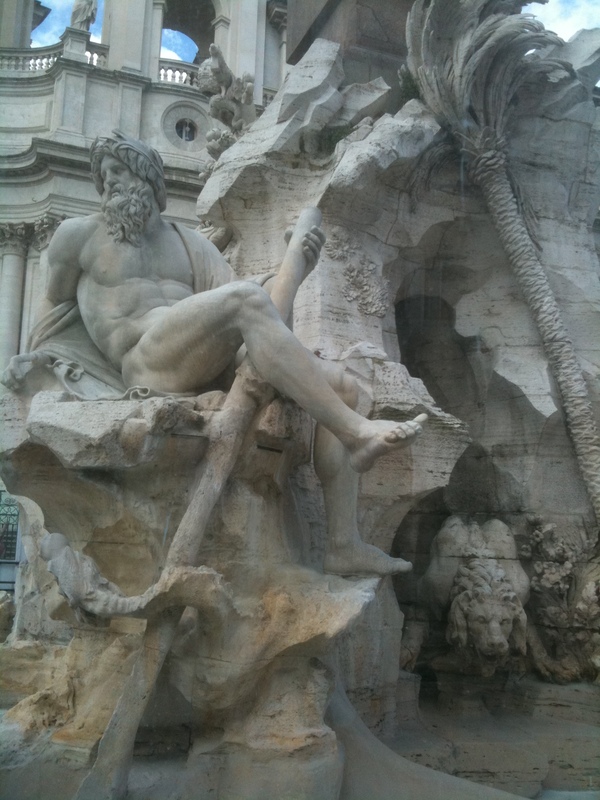 The first stop was the famous Trevi Fountain which was at the junction of three streets or tri vie in Italian. Before we arrived at the fountain, our lovely guide got us together and gave us a brief history of the fountain because it would be impractical to gather us together once we got there. Our tour guide told us that the fountain was the terminal point of one of many ancient Roman aqueducts which supplied clean water to ancient Rome. 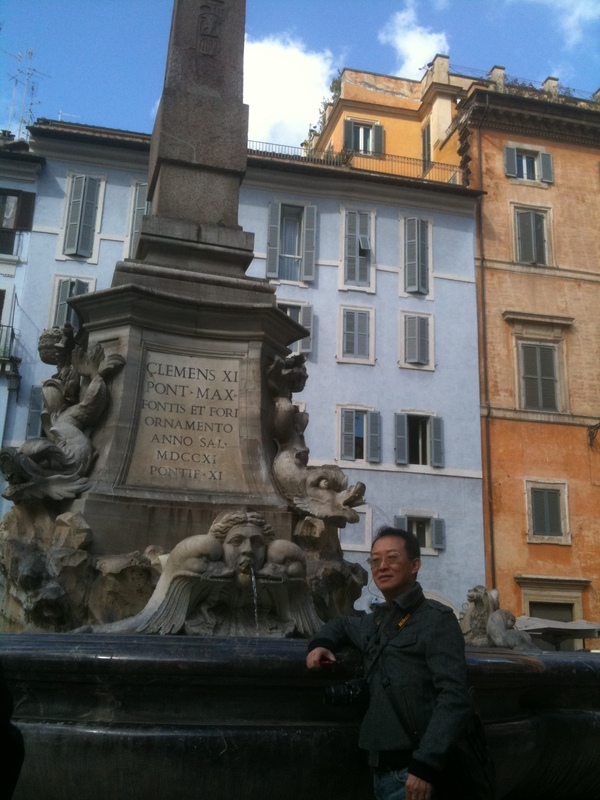 The concept of the fountain was originally sketched by the famous artist, sculptor and architect Bernini (widely regarded as the Successor of Michelangelo) in the late 17th century. 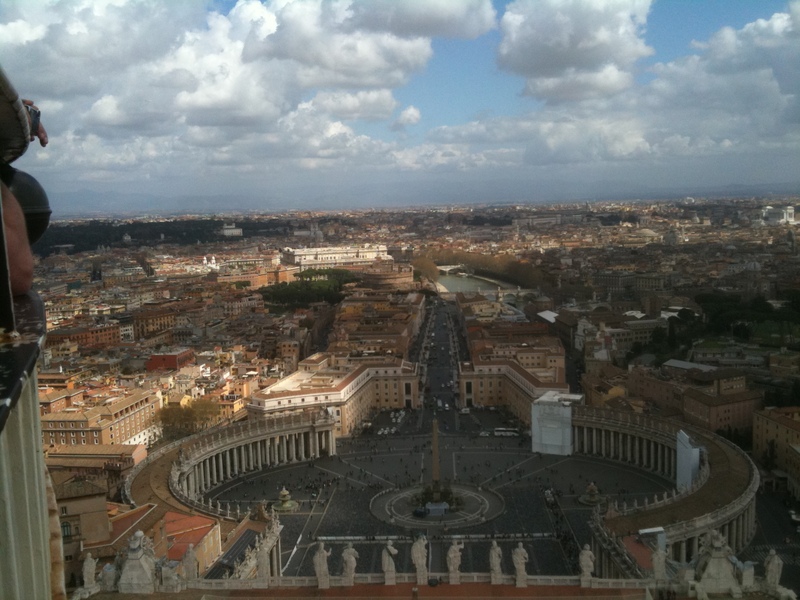 However, his project was scrapped because the Pope who commissioned the design and construction of the fountain died. The construction of the fountain was revived in 1930 by Pope Clement XII and finally completed in 1762. It was last restored in 1998 completed with a big pump. When we got there, which was a mere 5 minute walk from where we were dropped off, there were already a lot of people gathered around the fountain. We were told to take 10 minutes to take pictures and to throw coins, one or 2 but not 3 unless you want to divorce your spouse, into the fountain. 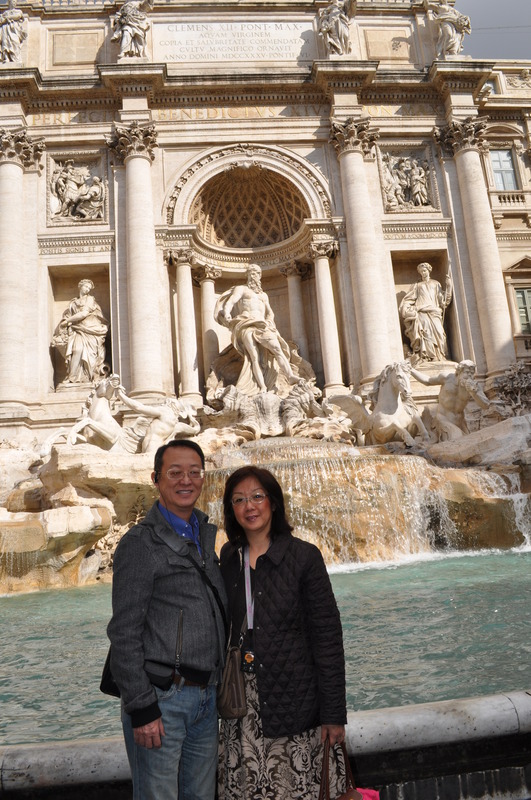 We managed to make our way to the edge of the fountain, took some pictures and threw one euro penny into the fountain which, according to our guide, meant that we’d come back to Rome one day. The fountain was without question the most beautiful Western fountain that we’ve ever seen. Nearby, there were many restaurants and shops along the three streets leading to the fountain. Many of them had set up tables on the sidewalk. Since it was still early, the restaurants have opened for businesses yet. I could image that the restaurants would be crowded by tourists at lunch and dinner times. I also thought about coming back to here and enjoyed a night out and a nice dinner here. Since we didn’t have time to waste, we quickly went to a gelato shop right by the fountain and had some gelato before walking to our next stop, Piazza Colonna and the Column of Marcus Aurelius. 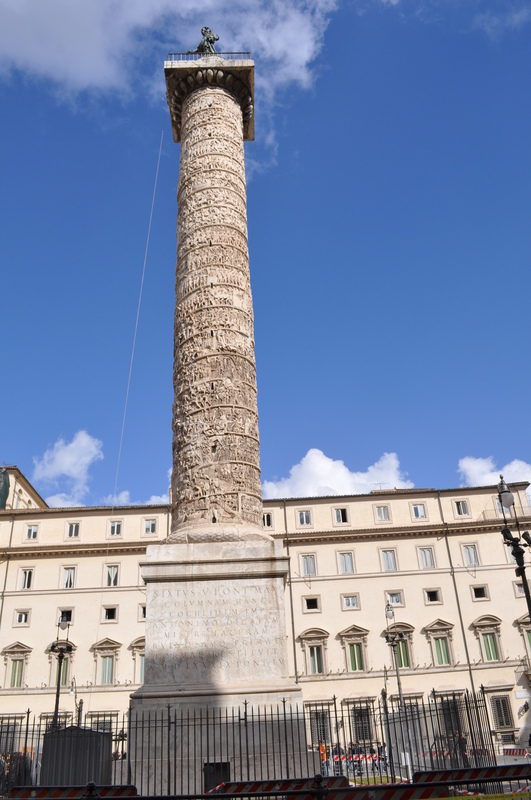 I wasn’t too sure what the tall column was for other than that it was constructed to pay tribute to Marcus Aurelius who was a Roman Emperor about 2000 years ago. It was so remarkable that the column has been standing here, its original location, for almost 2,000 years. A closer look showed the detailed art work of the raised relief of 2,200 figures on the column. In the interest of time, we didn’t stay here long because we still have a few more stops to go to. Pantheon was about another 5 minute walk from Piazza Colonna. It was a circular building of enormous size with more columns on the outside. In ancient Rome time, Pantheon was constructed to serve as the temple of all gods. Pantheon was later converted into a church called Basilica of St. Mary and the Martyrs. Unfortunately the exterior of the building was being refurbished when we got there but the sheer size of the building left me astonished of Roman’s engineering capability 2,000 years ago. 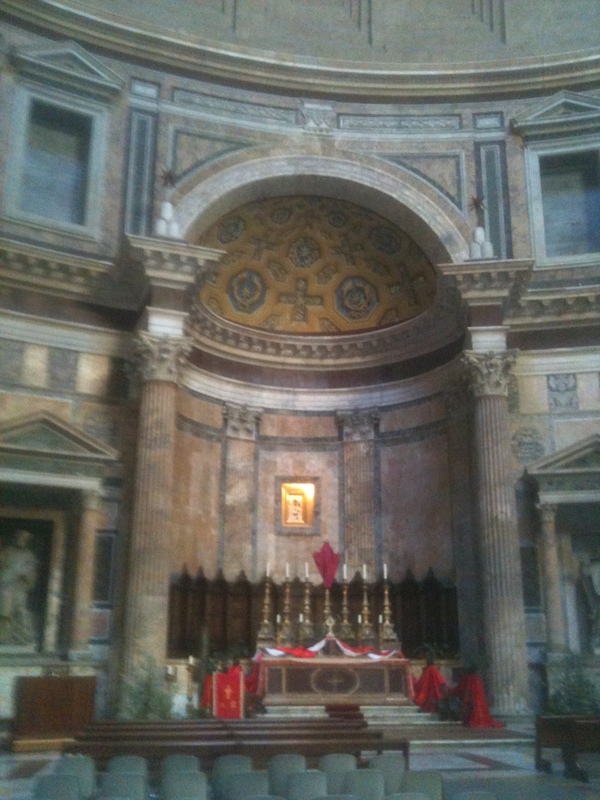 Our tour guide told us that Pantheon has the second largest dorm in Rome, second to the dome at Basilica of St. Peters. 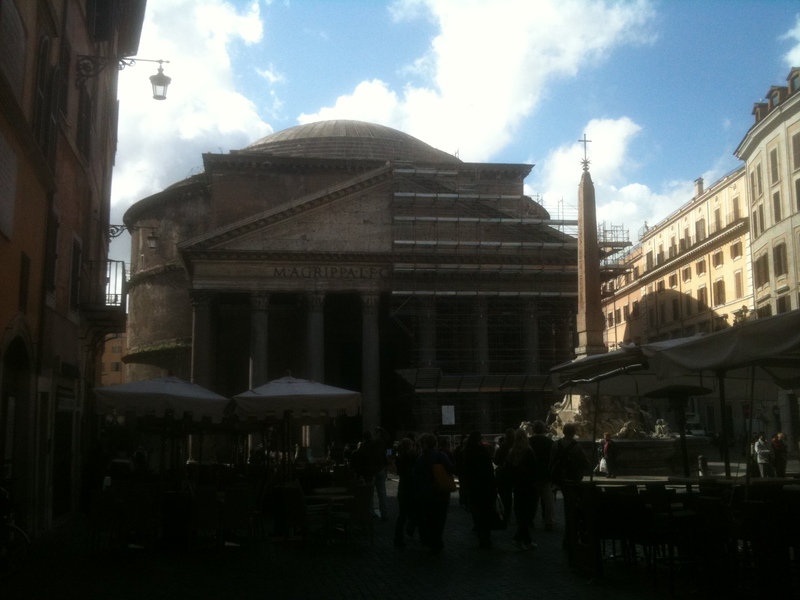 What made the dome of Pantheon different from the others in Rome is that Pantheon’s dome has a big hole in the middle. 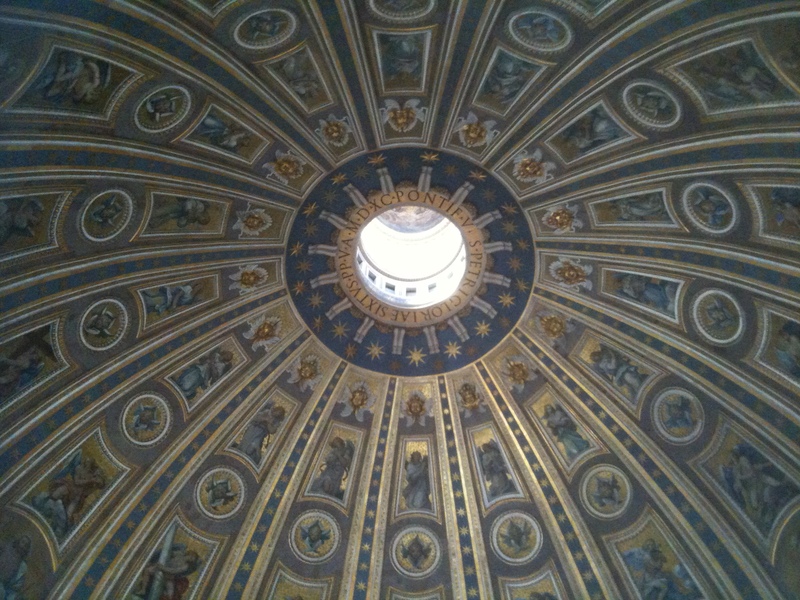 Since the dome has no window, The Romans left a big hole in the center of the dome to allow the sunshine in. 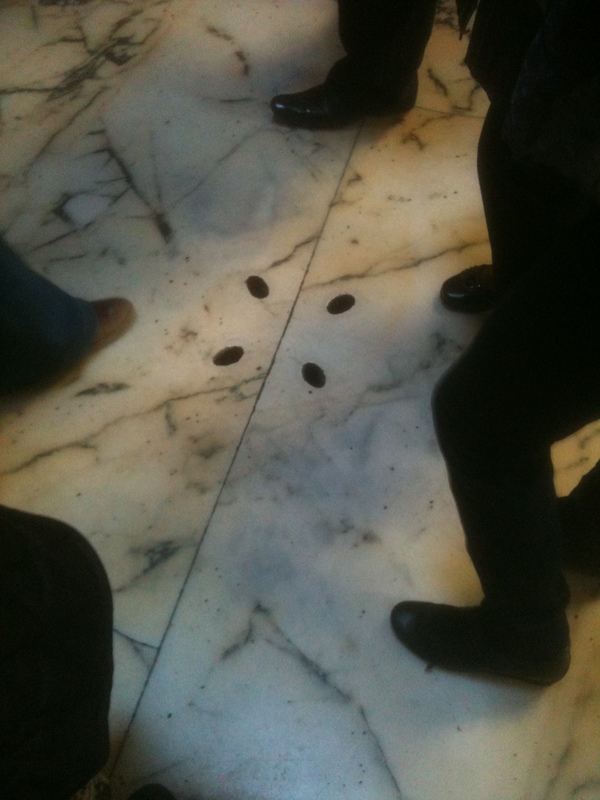 As such, the floor and the building were equipped with a drainage system to drain the rain away on raining days. Our tour guide pointed out the holes to us and said that the original system is still being used to this date. Wow! 2,000 years and still counting! Amazing! 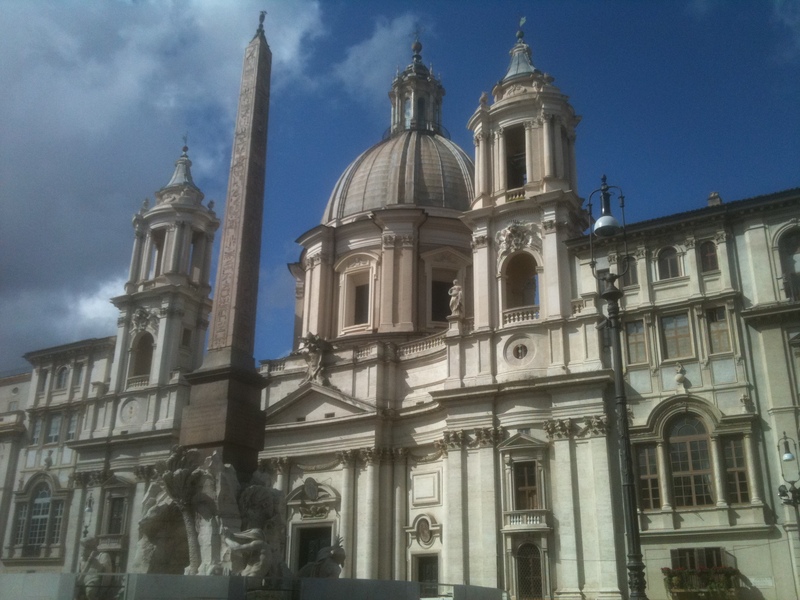 Piazza Navona, our next stop, was another 5 minute walk away. 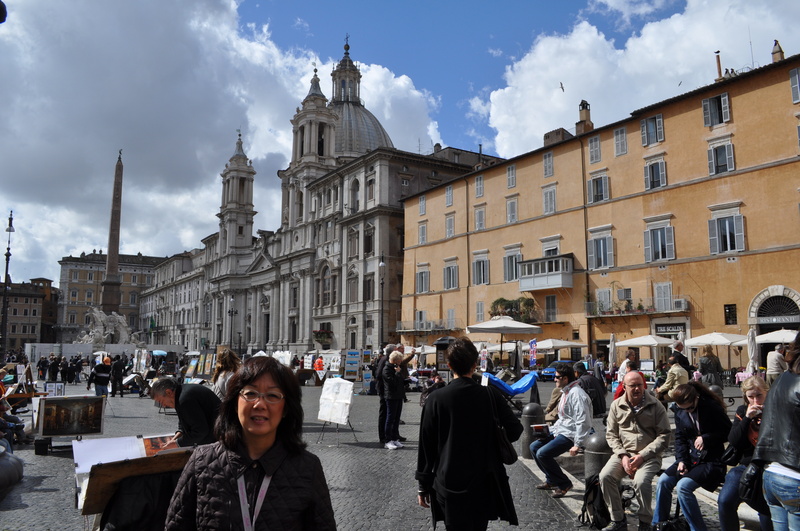 Piazza Navona was lively, charming and filled with artists of many kinds. The elongated public square within four walls of tall buildings had three fountains and a beautiful church. 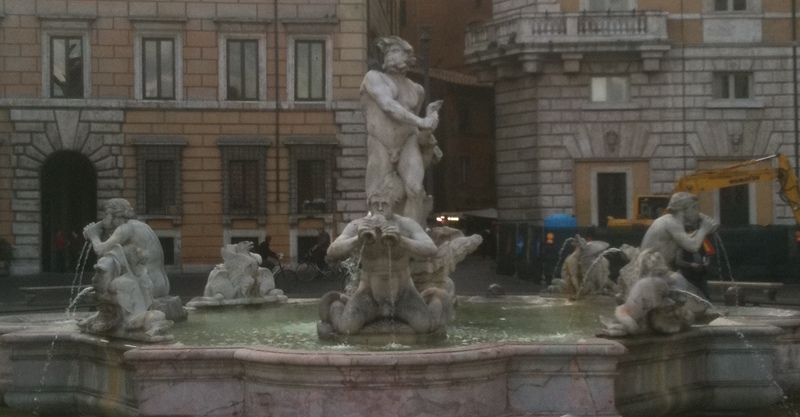 The Four Rivers Fountain was designed by Bernini in the mid-17th century, was under renovation. We still could see the amazing detailed art work of the sculptures through the Plexiglas windows on a fence surrounding the fountain. The four sculptures were four gods representing four major rivers of the known world at the time of Ancient Rome. There were two more fountains in the square, one each at the north and south ends of the square. There were many artists displaying their art work in the square and numerous restaurants lining both sides of the piazza. We took some pictures but didn’t have too much time admiring the art work because we were heading to our last stop of the tour, Basilica of St. Peters and the Vatican. 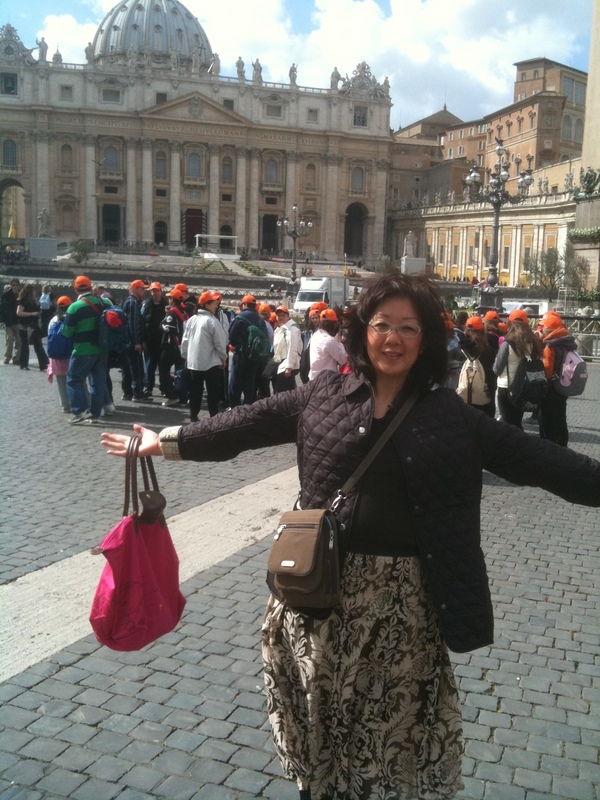 After a 10 minute pee stop at a souvenir shop near the St. Peter’s piazza, we headed to St. Peter’s Piazza. 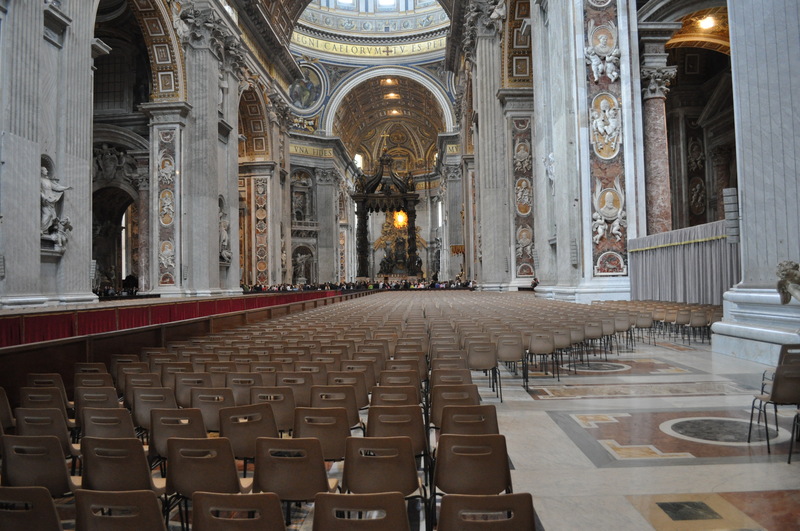 Well, before we could get in the basilica, we had to wait in line like everyone else: a line of about 300 to 400 people. It took us about 50 minutes to get in the church after passing through a metal detector. Before we got in the church, our tour guide told us that we’d gather around La Pietà by Michelan­gelo as a group and she’d tell us the story of the famous statue. From there, we’d go our own ways and anyone who wished to go back to the hotel should meet her in 25 minutes. We decided to say goodbye to our tour guide and stayed at the church for a little longer. La Pietà, created about 500 years ago, was placed behind a bullet proved glass panel to prevent it from damage by visitors. In 1972, the statue suffered its greatest damage in the hands of a mentally unstable geologist with his hammer. 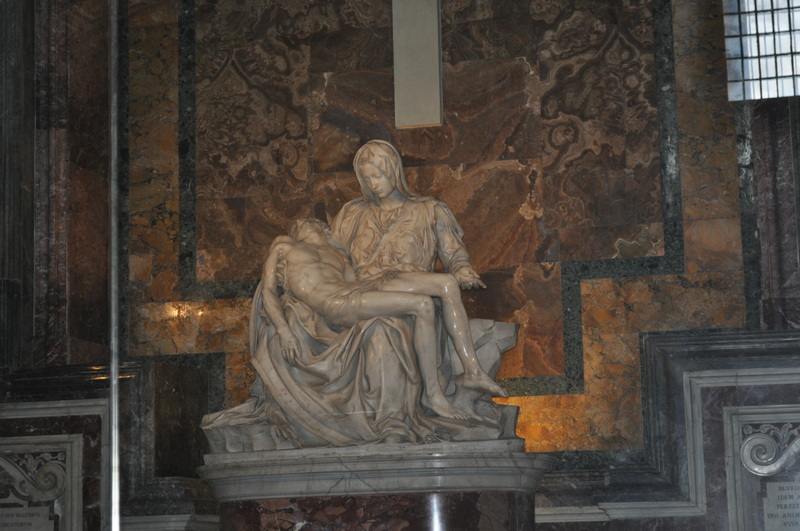 The statue shows a young and beautiful Mary holding the body of Jesus after crucifixion. The statue was elegant and was truly a masterpiece by the famous artist. We stayed inside the church for about 45 minutes and Bao decided to go to the top of the dome but I was tired from all the standing and walking the entire morning. 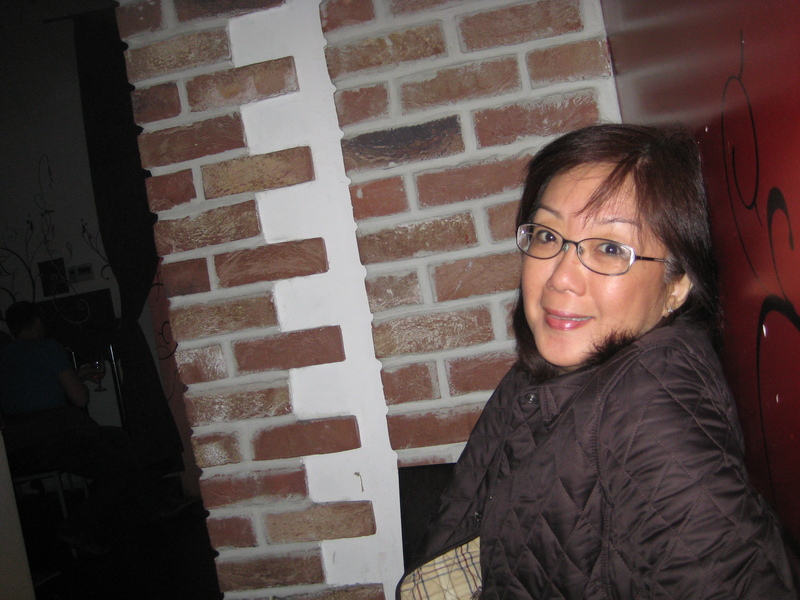 Since there was a long line to the dome and it was kind of cold inside the church, I decided to wait for her outside. After almost an hour she reappeared from the church and told me that it was truly worth the wait and the cost of about €10. 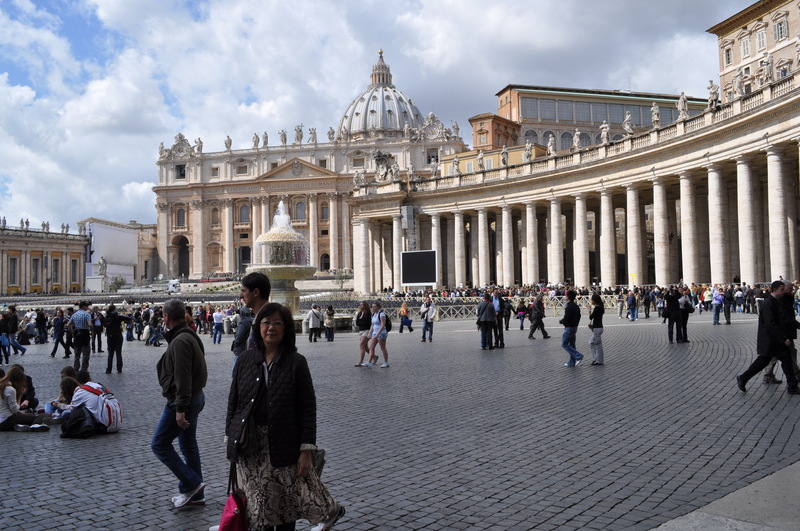 We then walked around the main street of Vatican in order to find a place to eat but couldn’t find a good restaurant. We avoided a serve-serve cafeteria because it was too busy. We finally settled on a restaurant called Nova Café with six or seven tables outside on the sidewalk. The place was really a tourist spot because the menu had six languages including English, Japanese, Russian, Germany, French and Italian. Since there were few restaurants here, their prices were cheap either. Well, maybe there food was good, I said to myself. We ordered a pizza and pasta with prosciutto. The tourists at the table next to ours were a middle-aged American couple who came from Michigan. They ordered a bottle of white wine, shared a pizza, salad and a cup of soup. The pasta was good but there wasn’t much prosciutto to speak of. 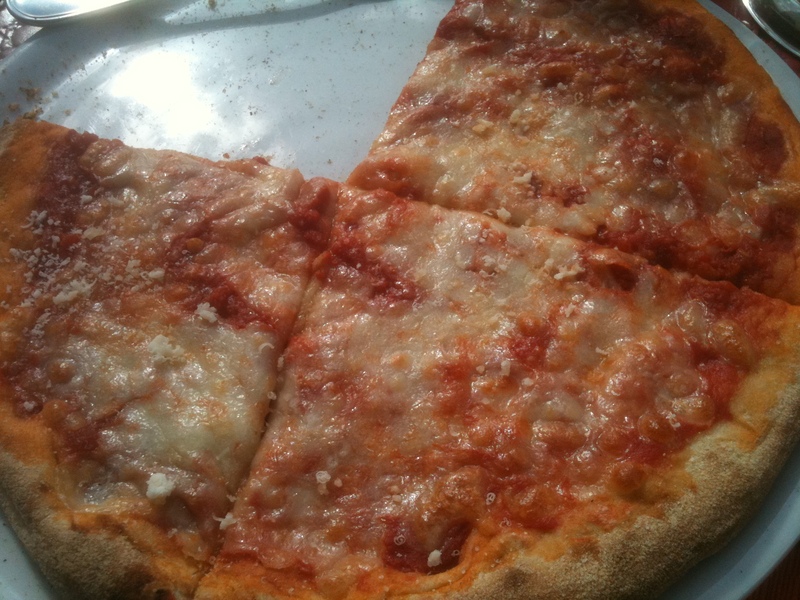 The thin-crusted pizza looked awful and tasted like cardboard. Our neighbors also agreed but we just had to make the best of what we have and enjoyed the pasta and made fun of the pizza with our neighbors. I called this 隨緣 “sui2 yuan2.” The worst of the whole thing was that we have to pay 15% service fee which was listed at the bottom of the menu. Because of our bad experience with Nova Cafe, let me forewarn you that you should avoid this restaurant by all means possible. 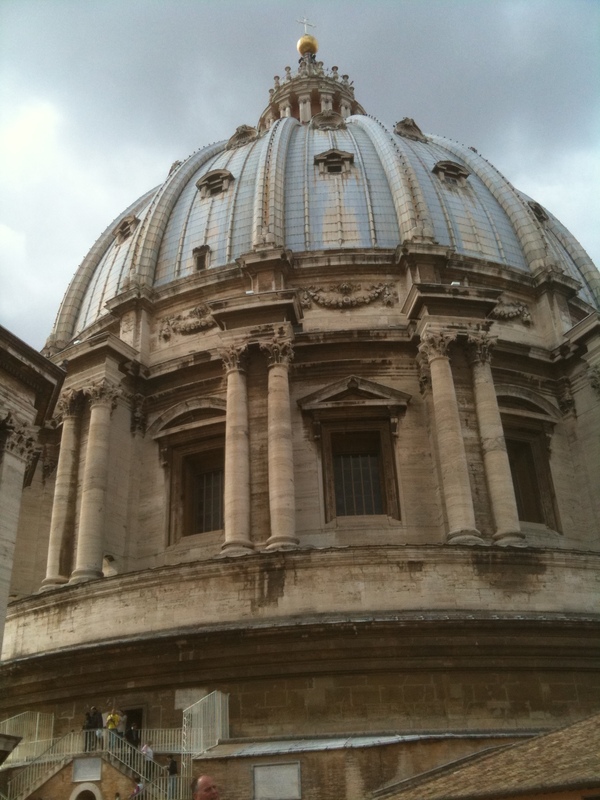 Well, we need to go to Basilica St. Paul to retrieve our camera. We took a taxi to there and got our camera. We also bought some more chocolate for ourselves because they were so good. We then took metro to Termini and stopped by the Internet point to check emails and review XB’s online Chinese resume. We then went back to the hotel for a nap after on our feet for the past 6 six hours. By the time we got up, it was almost 8 PM. We walked across the street to a pizzeria called Pastarito for dinner. To me, this was just a run-of-the-mill type of Italian restaurant and I wasn’t expecting anything special from a restaurant such as this one. But it was very busy though. Maybe it was a Saturday. 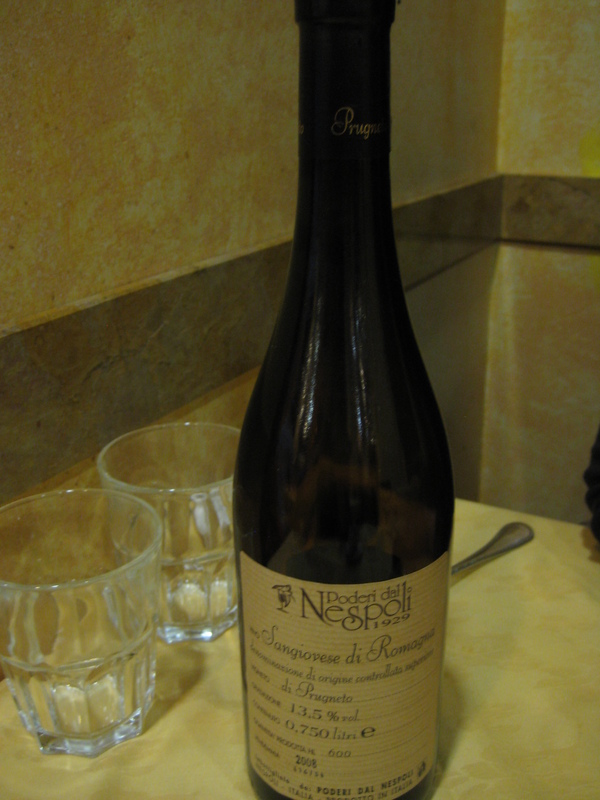 I ordered a bottle of 2008 Sangiovese di Romagna from a winery called Poderi dal Nespoli. I have always loved Sangiovese “sahn-joh-veh-zeh” which is the primary grape for Chianti from Tuscany. Romagna is a region in northern Italy between Tuscany to the south and Piedmont to the north. You may not have heard of Romagna but you must have heard of Ferrari, Lamborghini and Maserati which are manufactured in this region. Wine wise, this region is known for Lambrusco which is well known worldwide but is not my favorite. Our Sangiovese di Romagna was a dark red wine with a lovely and complex taste and floral and earthy scents on the nose. I was very impressed by a wine that sold for €12.50. We also ordered the following to go with our lovely wine: Cesar salad for €7.00, Bread with Pancetta with smoked Provola cheese €2.00, peppered Mussels in white wine sauce €7.90 and Milanese Risotto with saffron €7.90. A few slices of bread came in a basket. They were a little dry. A bad sign; I told myself. It got started on a wrong note. Cesare Salad at Pastarito was different from what we had in the U.S. 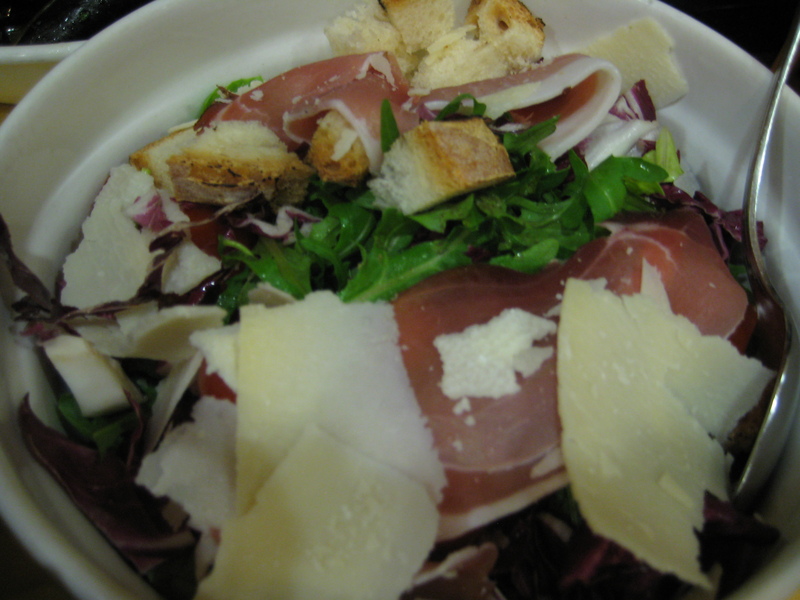 It was a mixed green salad with red radicchio, cherry tomato, thinly sliced, juniper-flavored ham from Austria, croutons, and shaved parmesan cheese. There was no dressing because it was supposed to be an oil and balsamic vinegar dressing that we’d add ourselves. Hmm, this was an unusual combination but it was unusually good. Fresh greens and very sweet cherry tomatoes were mixed with this special flavored ham that I’ve never had before. 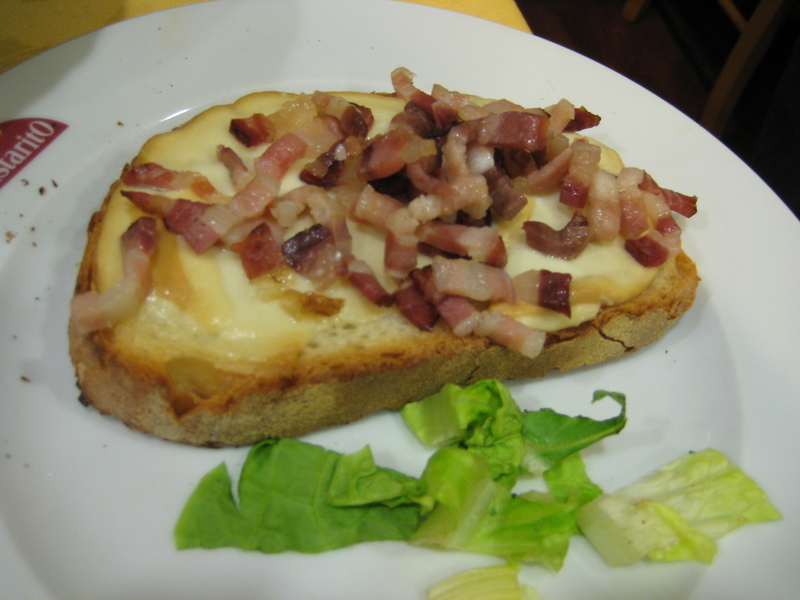 Bread with pancetta and smoked cheese was very good but, for the sake of lower cholesterol, I preferred the pancetta a little leaner and crispier. Perhaps, it could be stir-fried in a sauté pan before going into the salamander. 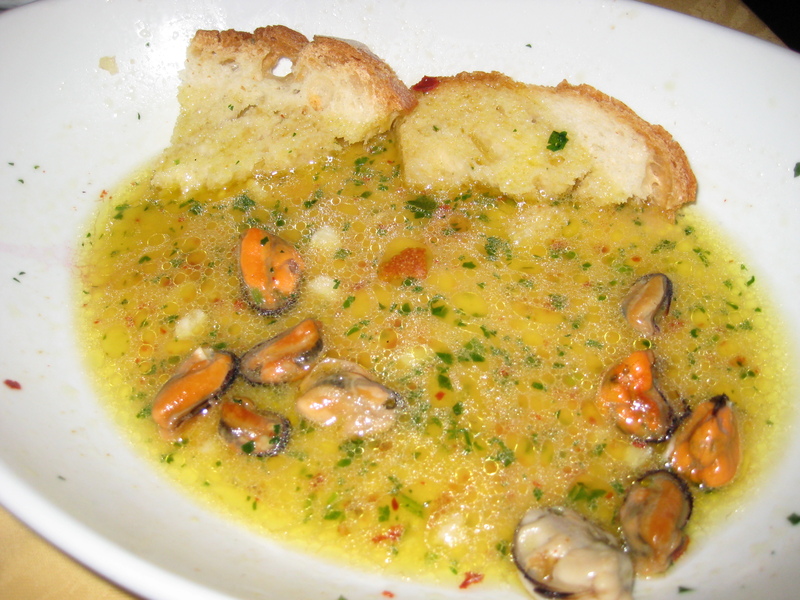 Next on was peppered Mussels in white wine sauce. 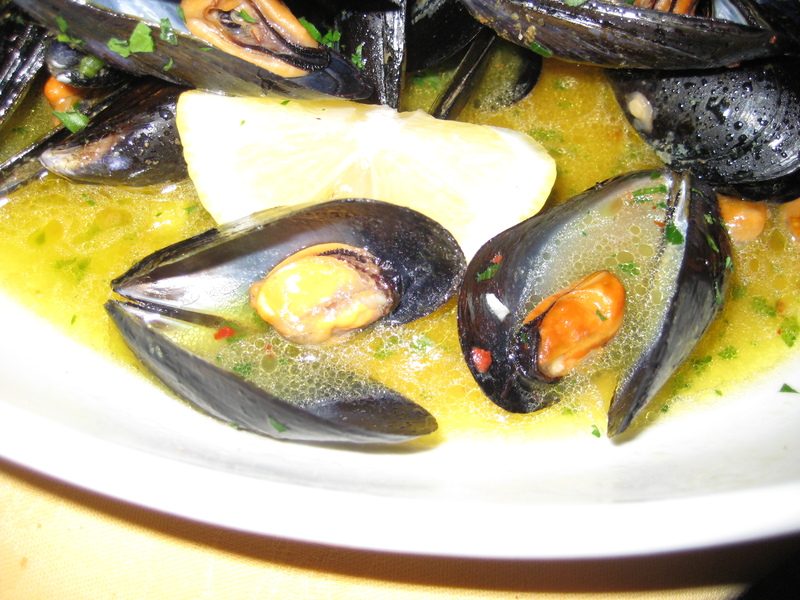 Mussels have always occupied a special corner in our minds even though we don’t eat them often. It was way back in the summer of 1989 when our family was living in Calgary, Alberta, Canada. We packed our new camping gears, took our two kids, ages 7 and 4, and drove our car to Victoria Island of British Columbia for a four night camping adventure. We camped at a camping ground about 10 miles north of Nanaimo. On the fourth day, we left our camp ground in the morning and drove to the city of Victoria with the intention to return to our camp for the night. After a nice lunch and a tour of the city in the afternoon, we started to drive back to Nanaimo after 7 PM. I had planned to find a restaurant on the way back and have some fast food before returned to our camp. It was getting dark and the highway on the island wasn’t the easiest to drive. Around 8:30, it began to rain and we couldn’t find any restaurant anywhere because many have already closed for the day. Finally as we drove around a corner, we found a small roadside cafe with their lights on. We were so glad that we finally could have something to eat because we and the kids were very hungry. We settled down to our table and realized that the narrow dining room had no more than 10 tables and all of them had white table cloth and fancy silverwares. We also found out that there was a violist who was entertaining the guests of the restaurant. Needless to say, this wasn’t a family restaurant and we were kind of out of place here. I didn’t remember what we have ordered that night but one dish we could not forget was their mussels with 髮菜 “fa3 cai4” in a white wine broth. I have had 髮菜 at Cantonese restaurant before but didn’t particularly like it. 髮菜 literally means hair vegetables because it, after soaking it in water, looks like human hair. It is a vegetable which can only be found in the Gobi Desert in northwest China. The Cantonese like it a lot because it sounds like 發財 “fa1 cai2” of 恭喜發財. The mussels were so tender and good, we ate them all. The broth was so delicious and flavorful that we soaked every piece of the bread with the broth and fed them to our kids. After dinner, rain continued and by the time we got to the camp ground, it was too wet for us to stay there. We ended up staying in a hotel instead. When we came back to Calgary and later back to the United States, I’ve tried to make that dish a few times at home. But to this date, my version didn’t even come close to what we had that particular night. Whenever we had a chance ordering mussels at restaurants big or small, we inevitably would compare it to that dish we had at a road side café on a rainy night somewhere between Victoria and Nanaimo. 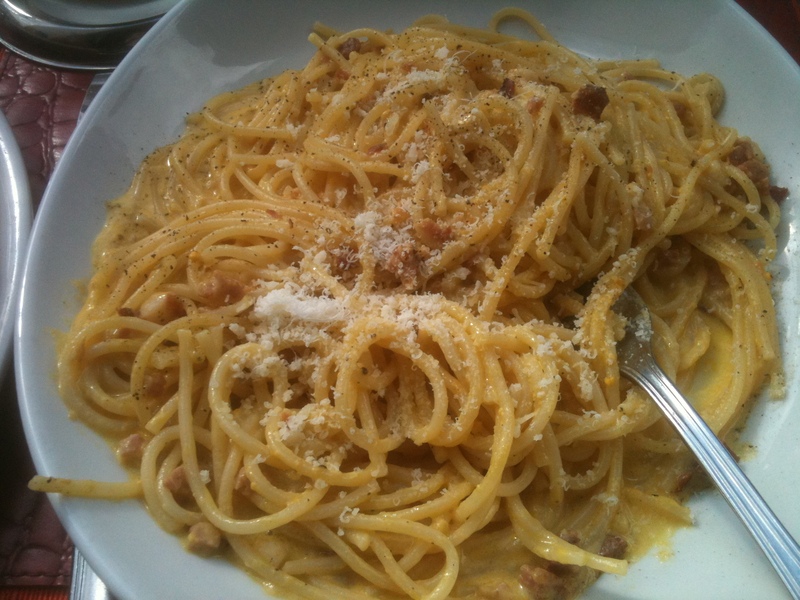 To our surprise, we found that dish tonight at Pastarito in Rome. The mussels looked fresh and tasted a little sweet to me. None of them was over cooked and they were perfect. The broth looked so appetizing and we couldn’t stop drinking it straight from the bowl. The bread now tasted so delicious just like the bread on that rainy night more than 20 years ago. We were happy and satisfied. 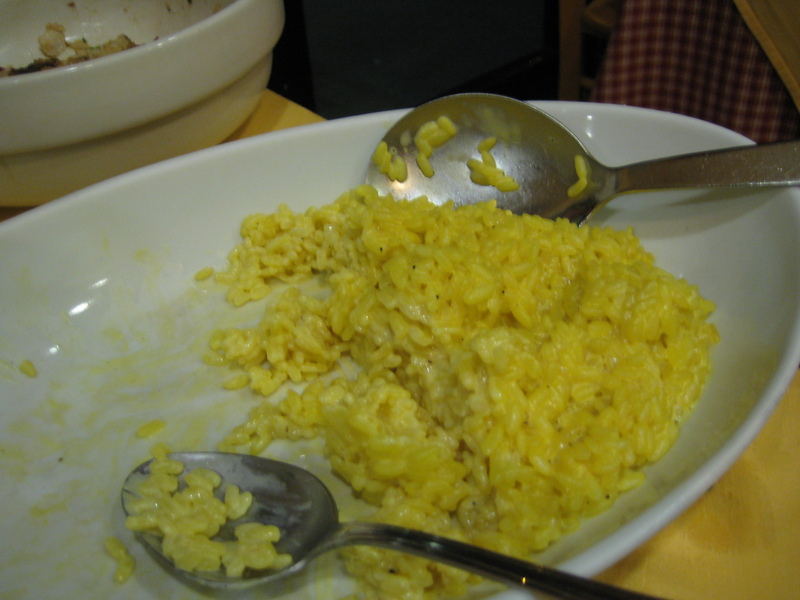 Risotto was good and filling but it would be excellent if it had a little more butter and saffron too. We then ordered some coffee but skipped desserts. The check was to €43. What a deal! 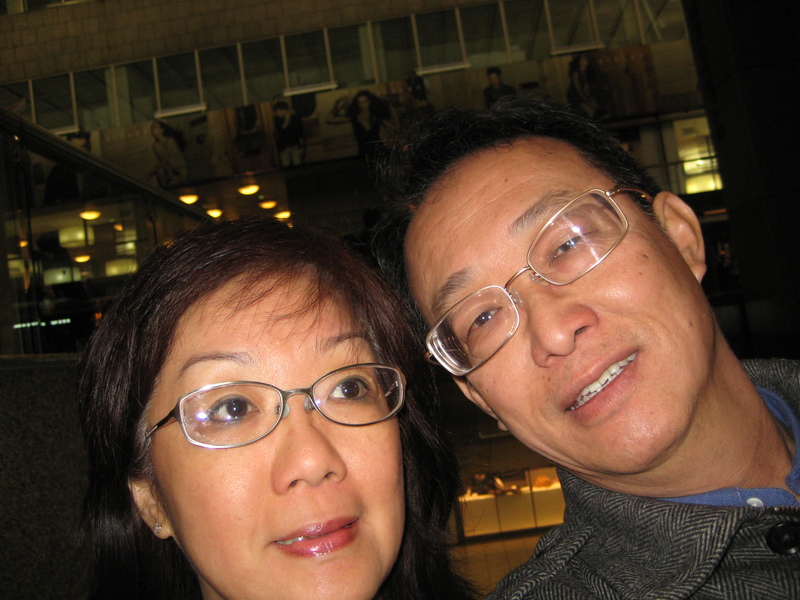 Since it was still early and we had already taken a nap earlier, we went to Roma Termini for a walk. Later, we went to a bar called Twins across street from Roma Termini for a drink. The bar was crowded with young people and there were more guys than girls. It was very loud and we couldn’t even hear each other. Well, I guessed we really didn’t belong here. Shortly after midnight, we left the bar and walked back to our hotel. Tomorrow was Sunday and our Rome Illuminated tour began at 8:30 in the evening. We’d have plenty of time on our own tomorrow.